I have mentioned about this movie for dog lovers. 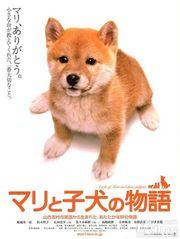 Now, here's another one - A Tale of Mari and Three Puppies, a 2007 Japanese movie. Found two good reviews about this movie. The true and inspiring story of Mari can be found here. Wonderful things do happen. It all depends on how we decipher them.